UPDATE - NO QT today. BBC QT website has had a great new makeover which means its previous deadly dull, boring, but informative page has been replaced one which is just a plug for iplayer. So I don't even know where the show is coming from or who's on it. But it does have an online application form for the QT audience. 5. What two issues would you like to discuss in the current news? 6. What is your opinion of the situation in Afghanistan? 7. Are you pro-EU or sceptical? 8. During the series, we shall be visiting London and various cities and towns around the country. Would you please name the venues most convenient for you. 9. 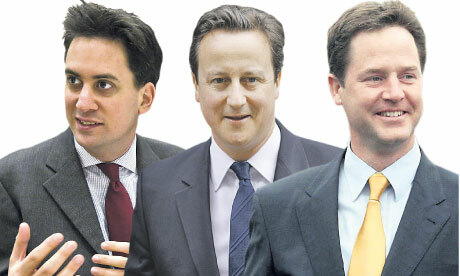 If there were a General Election tomorrow, which political party would you be most likely to vote for? 10. Do you fully support the leader of that party? 11. Which of these groups do you consider yourself to belong to? 12. Do you consider yourself to have any disabilities? 13. If you are disabled, do you require wheelchair access? 14. Are you a member of a political party? 15. The audience for BBC Question Time is totally proactive and we wish to ensure that the opportunity to put forward questions and take part in the debates is given to those people wishing to participate. If chosen to attend you will be asked to put forward two questions, one by email and a further question on arrival at the venue, would you please confirm that you are keen to get involved and if selected will ask your question. 16. Add any more relevant information. We need to contact each applicant, so if applying with friends or family, please give the names and daytime telephone numbers of each member of your group. 17. The information you provide will be collected by the BBC. The BBC will share your information with Mentorn, producers of Question Time. Are you happy for your email details to be retained for up to 4 years on behalf of Mentorn, so that Mentorn may contact you about appearing in the audience for other BBC programmes? A eurosceptic question ? That's very interesting. Why would that be deemed more important than say, a privatise NHS one? Or a Scots independence? EU concern is supposed to be insignificant in polling data. A reader informs that there is no Question Time tonight. 7/8. Actress Gwyneth Paltrow traces the background of her parents. Tracing the history of the turban and its crucial place in the Sikh faith. Must say watching nothing does look rather more interesting. Have to go with most of those. - Border agency can't cope with Olympics. Can't cope with holidays. Can't cope with illegals on the run. What can they cope with? - Abu Hamza and extradition. _ is America really a human rights violator and does this legal argument just prove that human rights lawyers are the new estate agents and wheel clampers? - Must be time for an NHS question - Alzheimer related? - Charity relief u-turn coming? Hope you have a fab hol, Bill. 2. Snooping bill. Or should that be Snooping Bill? If it's EU driven we don't have a choice anyway. 3. One-eyed extradition and the 'special relationship'? 4. Foreign aggresion; Syria/Russia/China and our useless pretty boy Cameron not only keeping Afghanistan going but urging 'further action' in Syria. 1) Charity donation write off row: Certainly yet another PR disaster for the Gov, but is it right in principle? (the Telegraph says the 50% of total income comes from just 8% of the donors, so the limits will come into play for the majority of those ppl/orgs). 3) Snoopers charter. leading to : Why is Nick Clegg such a looser? 4) NHS - overnight discharging to save bed spaces. 5) Syria - should NATO/Turkey invade? David Dimbleby presents Question Time from Leeds. On the panel - shadow home secretary Yvette Cooper, Conservative party co-chairman Baroness Warsi and the president of the Liberal Democrats Tim Farron. Hmm, Seems as informative as usual - just nothing about tonight 'coz there is no tonight! Q3(how old am I): 55-64 - Please add 10 points to my score as this is correct. q6 & 7 are leading us on a bit, but someone will get it right. what happened to q1 & q2? It is soaps at prime time all over the tv these days. 1. Boris v Ken .... brings tears to my eyes. 2. Give us your tax return ... Charity! 4. Secret courts but sentencing on tv? It all leads to a fishy business. What did go on in China, BQ? I hope you had a good break too, BQ. Bill you are messing with my head, how do you manage to post on a non-existent programme on a date that hasn't happened yet ?! Just got the wifi on . What on earth is going on? 18. Give details of your bank, sort code and account number.